Thailand’s Crisis and the Fight for Democracy is Giles Ji Ungpakorn’s latest work concerning the on-going political crisis that has engulfed Thailand since the military coup d’état of 2006. The book analyses the nature of the deep political divisions between the “Red Shirts” and the royalist “Yellow Shirts”, starting from the creation of the People’s Alliance for Democracy, through the 2006 coup and up to the end of 2009. It discusses that in trying to understand the political crisis, it must be seen in its entirety, including elite divisions and disputes, but also the roles of Civil Society activists and the constantly developing social movements which are made up of ordinary people. Please join us for an afternoon discussion with one of the most recognized voices on the issue of Thai politics. Copies of “Thailand’s Crisis and the Fight for Democracy” will also be available for purchase. 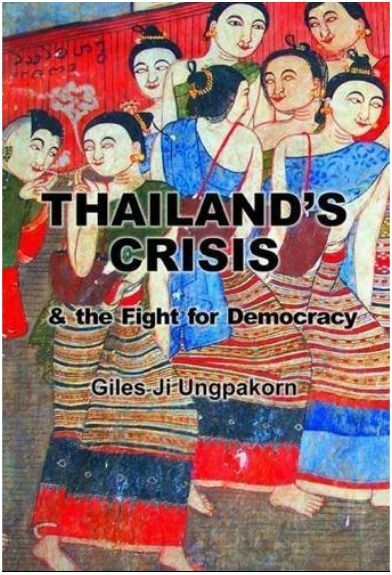 Associate Professor Giles Ji Ungpakorn, an exile Thai independent scholar and political activist, taught at the Faculty of Political Science at Chulalongkorn University in Bangkok, Thailand from 1997-2009. In February 2009, he fled Thailand after Thai government charged him with the lese majeste law after the publication of his book, “The Coup for the Rich”, which criticized the role of the military and the elites in the coup d’état of September 2006. Giles was educated at Durham, Sussex, and the School of Oriental and African Studies. He is widely published, having written for The Asia Sentinel, New Statesman, the Guardian, and a numbers of journal articles in Journal of Contemporary Asia, Inter-Cultural Studies, and Ratasatsarn, a Thai political science journal. Giles is recognised by English PEN, a non-governmental organisation working to promote and protect the right to freedom of expression, as its honorary member. The book’s cover page is colorful, good taste, unique and outstanding! Have a look at his wdpress blog; he has his contact details there. If you’re in Thailand, you can get a copy sent in a week or so. I think this book will be one in taboo book series for Thailand. The cover is part of the Wat Phumin murals from Wat Phumin in Nan Province. Maybe there is some specific significance? My order is being mailed today and I am reasonably certain the US censors will let it through. Since it does not seem to be a direct quote, the quality and type of the journalism and commentary is also a major factor. Perhaps it is best not to only focus on finding in this quote the “misunderstanding” of PM Abhisit, but also on those who “quote” — or “use” — him in this way. It’s up to the press to quote, react, and comment appropriately, too. And it’s up to us to read Piece X in the spirit of Piece X and only take away from it what we can or could from reporting/commentary/journalism/press statements of that type. Fortunately or unfortunately, the issues are very broad. Here we go with my sixth or is it seventh attempt to get a comment accepted on this thread. One thing that I must admit is there was a time when Giles did take a very principled stand on Thaksin and the PAD. Far more principled I will admit than my very vague views were at the time. So let’s go back to April 2006 and see what Giles was saying. The principle reason for this alliance with the conservatives is that PAD’s leaders have no faith in the independent strength of the people’s movement, and are therefore looking for “more powerful” allies. But the problem with all such cross-class popular fronts is that the social movements participating have to drop their more radical demands. This means that PAD leaders can only talk about Thaksin’s corruption and must ignore all the other valid reasons for getting rid of his government – which include the gross human rights abuses in the south and his support for neo-liberal policies. So let’s bring it forward to 2009. Did Giles look for “more powerful” allies in the pro-Thaksin movement? Does the UDD as cross-class popular front cause Giles followers to drop their more radical demands? Does the recent reluctance to talk about Thaksin’s corruption show the other side of the coin? We in the People’s Coalition Party are calling for people to choose the abstention box on their ballot paper. Together with sections of the student movement, the Assembly of the Poor (a rural movement) and the Thai Labour Solidarity Committee we have set ourselves the difficult task of pushing for a progressive political reform agenda – rather than simply concentrating on getting rid of Thaksin. What a shame he is so much connected with bringing back Thaksin now. Quotations taken from Giles’ article in Socialist Review. You can find it at the link below.